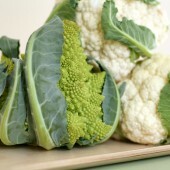 Come November, I eagerly hunt for cauliflowers at my farmers’ market — precious and wondrous gifts from Mother Earth. The cauliflowers grown by local farmers are not the oversized, Popeye-like grocery store variety. They are usually small in size, delicate and crispy. They come in all kinds of different colors (snow-white, orange, purple, lime-green), and shapes (the Romanesco cauliflower in particular, with its pointy florets, always attracts lots of attention from shoppers!). Whether they are roasted, sautéed, fried, gently boiled in milk for a luxurious purée, or braised, cauliflowers are utterly delicious. I can honestly say that I look forward to the season all year-long! Today’s gratin is a classic French recipe, but instead of just blanching the cauliflower (as it is normally prepared), I decided to braise it in shallots and wine until perfectly tender — a step that adds a wonderful dimension to the dish and deepens the subtle flavor of the cauliflower. Once braised, I top the tender florets with a light béchamel sauce made with lots of freshly grated nutmeg. Then I sprinkle the whole thing with a little cave-aged gruyère, pop it in the oven and bake it until golden-brown and bubbly. Needless to say, resistance is futile! If you serve this gratin as a main course with a side salad, then pour a Pinot Noir from Willamette Valley in Oregon, or a California Zinfandel. Both wines team up beautifully with the spiciness of the sauce and the richness of the aged gruyère. Step 1: Heat a large heavy-bottomed skillet over medium-high heat. Add the olive oil, red pepper flakes and shallots and sauté for 2 minutes until the shallots start to soften but not brown. Add the cauliflower and garlic, toss well and sauté for 2 additional minutes until warmed through, tossing only a couple of times. Add the wine and toss well. Then add salt and freshly ground black pepper to taste, toss again. Reduce heat to medium-low and cover pan. Braise cauliflower for 8 to 10 minutes until tender. Uncover pan and sauté at high heat for 1 to 2 minutes until all juices have evaporated. Transfer to the prepared baking dish. Step 2: In a medium heavy-bottomed saucepan over medium-high heat, melt the butter. Whisk in the flour and cook, whisking constantly for 1 to 2 minutes until the mixture becomes foamy and the flour becomes golden but not brown. Quickly add the milk and whisk constantly until the mixture is well blended. When the mixture starts bubbling, lower heat and slow-simmer for 6 to 8 minutes until the béchamel has thickened. Add the salt, pepper and nutmeg. Mix well and remove from heat. Pour the béchamel over the cauliflower and sprinkle with the cheese. Bake for 25 to 30 minutes until top is golden-brown. Remove from oven and let cool for 10 minutes before serving. 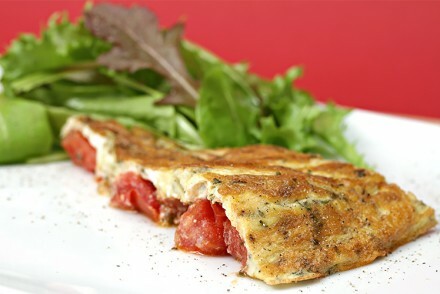 Cook’s note: The gratin can be baked, cooled and refrigerated up to 2 days. To serve, bring to room temperature and bake at 425°F (220ºC) for 8 to 10 minutes until hot. The second time making this delicious dish, I made it with a cup of warmed heavy cream under the cheese instead of the white sauce so my gluten-intolerant friend could enjoy it. Yum! The orange cauliflower looked so good, too. Again, another holiday under the influence of Vivianne! Thank you and Happy New Year! Dear Kay, Happy New Year to you too! It looks like you had a most delicious holiday. I am so glad the heavy cream worked well instead of the bechamel. It makes the dish a little richer, but delicious nonetheless. I am also thrilled the orange cauliflower looked and tasted good in this dish. Kay, you are so wonderful! Thank you for your kind words and for all your comments. I wish you and yours the best New Year ever! 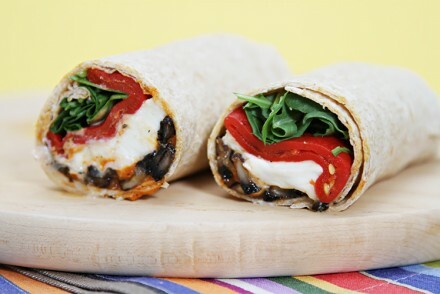 This is an incredibly yummy recipe and we found it even better when reheated. The way the cauliflower is prepared is subtly tasty. We used orange cauliflower and how pretty that was. Could I make it gluten free by exchanging heavy cream for the white sauce do you think? That looks like a perfect holiday side dish! The cauliflower puree was a big hit at Thanksgiving. This looks quite delicious, I will definitely give it a try. I hope you and your husband have a wonderful holiday. We made this for Thanksgiving – and it was a hit! Thanks for the great idea. Elise! Thank you so much for your comment… You really made my day! Your photos are always a joy to admire, and it surely elevates the cauliflower to be an ingredient to reckon with! Roasting cauliflower for our Thanksgiving dinner. Always a welcome flavor for any meal! Shallots, red pepper flakes, and wine worked for me…adding the bechamel took the dish over the top~lovely! 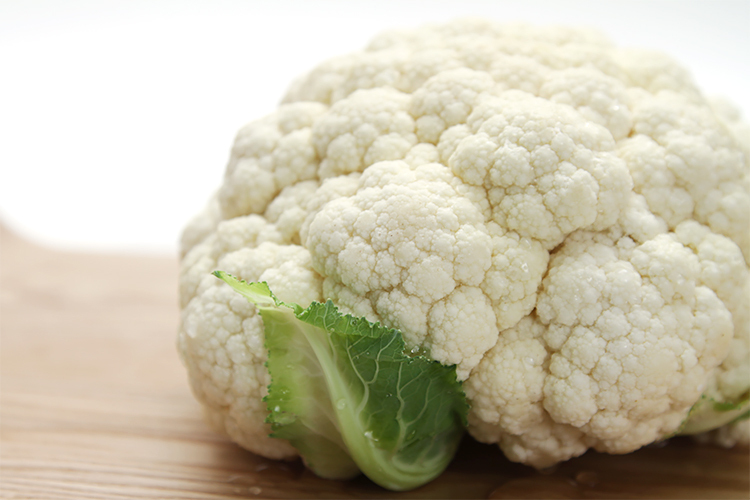 Going to be picking up some cauliflower at the farmer’s market today for this. The nutmeg is the perfect flavor to go with cauliflower and a bechamel sauce. Great job! Your Romanesco cauliflower is gorgeous. A video — you are definitely a foodtechie or some mash-up of foodie and techie. I’m impressed! And, your cauliflower sounds amazing. 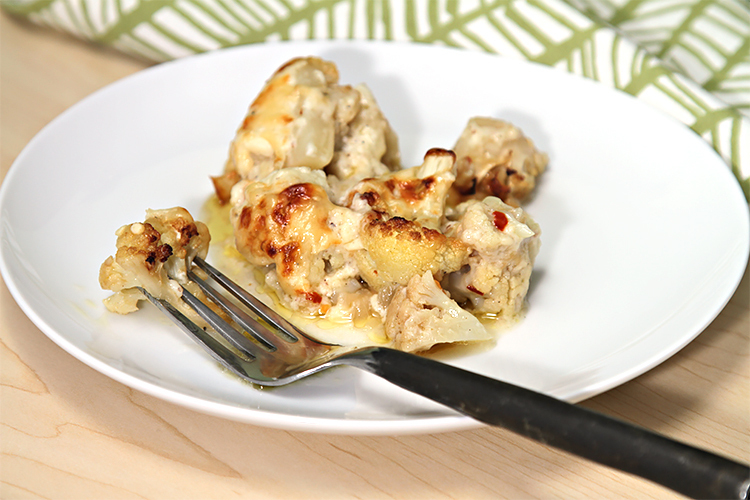 Gratin is one of my very favorite ways to enjoy cauliflower. I like the braising touch! I love nutmeg. It adds a rather distinctive warming taste to a dish. I like gratin style of food and into the veggies. I’m sure they’ll love this. Thanks for sharing. oh wow, that looks so so good! I usually roast cauliflower, but I have definitely been missing out. This looks divine! I’m going to try it out for Thanksgiving. Thanks for sharing the recipe! I have just recently gotten my husband to appreciate cauliflower by roasting it. I’m sure he will go crazy over this dish. That is, if I will share it with him! 🙂 I think I could probably be very happy with just the braising – it sound incredible. 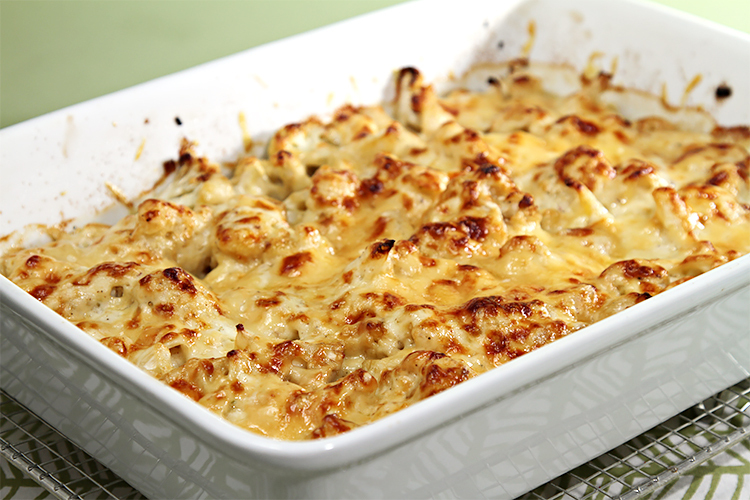 Cauliflower au Gratin in the traditional form here, with a Bechamel sauce and Gruyere cheese is fabulous. Of course, fresh grated nutmeg is great, not just for the sauce either. I love the idea of braising it in wine – I can just taste the tenderness of it. My friend has been looking for a good gratin recipe and so I’ll definitely have to point her here! This sounds so heavenly. Yum! Looks delectable and very gourmet. What a beautiful dish. I like using cauliflower in gratins as well and can’t wait to try braising it in wine. It must have such great flavor! I love this gratin. Well, I can’t wait to eat it. Still waiting for cauliflower season here. Oh, wow. This looks absolutely fantastic! I’ll definitely be trying this one soon.